Love Grows Here – Keep Out! I have started walking. Again. We’ll see. . . Anyhow, on my walking route I pass this lovely garden area next to someone’s front door. I mean it is lovely. Lots of flowering plants (even in this triple digit heat we have had for weeks now) and large green leaves. It is well maintained and cared for. You can tell. Planted in the very front, for all the passersby to see, are two signs. One is so pretty and in colorful cursive says “Love grows here.” What a neat sentiment. Inviting. Hopeful. Maybe even inspiring. Until you look next to it. Black and orange. Bright, glaring, ugly. “You are not wanted,” it says. “You are not welcome.” In spite of what is right next to it about love, this is the message that is most boldly proclaimed. And it made me wonder. . . Which of these two signs does my life portray? And I boldly proclaiming that no one is welcome in my life? Or am I saying I am trying hard to grow love and would like to share it? Which is the sign your life is proclaiming? If you are anything like me, you have quit spending anything on hair accessories, no matter how cute they are, because they just don’t hold in your hair. It is so frustrating to find a clip or a barrette or a comb and purchase it, just to find the first time you place it in your hair it slips right down. Or worse – it slips off and you lose it. Lilla Rose Flexi Clips have changed all that for me. Not only are there tons of adorable styles to choose from, they actually hold my hair. Some styles still slip but it is easy to put a small band underneath the clip to hold it in place. And I get to use the cute clips! I recently received Hibiscus Sea and Morning Joy for the purpose of this review and boy, do I like them! They have both gotten lots of use already! My favorite size is honestly the XL, especially with summer here. Okay – it might only be May but the heat is starting to hit and I am wearing my hair up a lot now. But these XL Flexi Clips allow me to quickly pull my hair up into a bun. No fuss, no muss. I can truly have my hair done in under a minute. Just twist it up to a bun and place the clip over the top of it. It is neat. The clips adds color and interest and, yes, even cuteness. It stays put. And I don’t have to mess with it. On days like today, when we were out in the heat and the wind, hair stayed put and still looked decent when we came in an hour and a half later. I have at least one clip of each size and I do like them all. My daughters all have at least one clip each, as well. They do a fantastic job of making hair pretty and holding it in place. Not sure what size is right for you? You can ask Jennifer (the post sponsor) by contacting her at http://www.lillarose.biz/prettyhair/ (there is a banner in the middle of the page with Jennifer’s picture on it; click that and there is a way to email her) or visit Lilla Rose to see the style videos and suggestions they have. While looking for the videos, check out all the varieties of Flexi Clips they have. There are new ones all the time. And if these are not your style, they also have hair bands (which are lovely and stay put, too – I have one that I enjoy wearing), bobbi pins (which my girls love to decorate their hair with after they pull it up in a ponytail), U pins, and more. If you haven’t tried Lilla Rose, I highly recommend giving this company a try. Jennifer is a wonderful consultant (I’ve known her from the blogging world for a few years) and will answer any questions you have. Contact Pretty Hair (a Lilla Rose consultant) through the Lilla Rose website – http://www.lillarose.biz/prettyhair/ – or through Facebook. This post was sponsored by Lilla Rose consultant Jennifer (*******). I received two free clips in exchange for my honest review. I was not required to write a positive review nor was I compensated in any other way. All opinions expressed are my own or those of my family. I am disclosing this in accordance with FTC regulations. Sometimes, I find that I struggle with setting goals. I don’t want to fall short. I have found myself several times lately thinking something like “I won’t even try because I can’t do it.” This often happens when I see something that requires a lot of activity over an extended period of time. I have found, though, that if I create a much smaller goal with a larger end point in mind, I don’t struggle as much. An example? Walk for 20-30 minutes per day. No distance required so for those days when I am hurting or exhausted, all I have to do is make the time. I don’t have to push super hard. But for those days when I am energetic and feeling good? Then I can do some running and go further and longer. I have also found that if I write things down, I am more likely to hold myself accountable. If I tell someone I trust about a goal, they are also more likely to hold me accountable because, well, they can since they know. (Something about that knowing – if they don’t know, how can they help?!?) At Home Dad has changed his morning routine to help me meet my daily goal of walking. He did that because he knew about my goal and wanted to help me meet it. So, with all that rambling in mind, I decided to show you my goals. I wrote them down on the printable that I had created and shared with you in my post on The End or The Beginning? Here are my 2017 Goals. At Home. 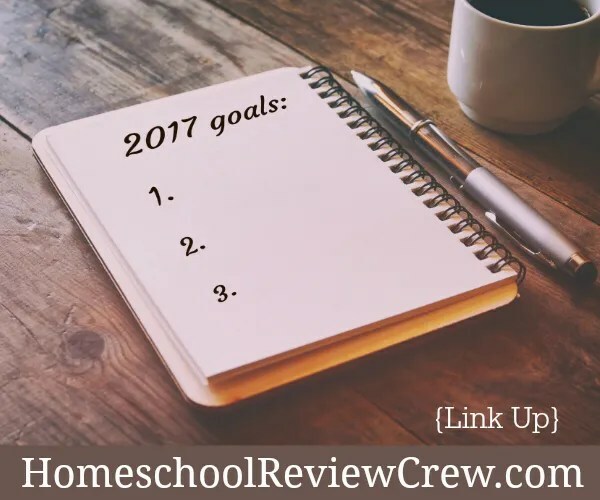 Linking up with the Homeschool Review Crew’s discussion about goals in 2017. An end and a beginning. Which do you see? As the end of 2016 very quickly approaches, I see just that. An end. Finality. The finish line. But is it really? No. So, I find myself wondering. – what did we do right? – what did we succeed in? – what did we make better? – where did we grow? – where do we need to do better? – where do changes need to be made? – where did we fall down? – where did we fail? The end of the year is a natural time for reflection and re-evaluation. But, did you notice that all of these statements have a “we” in them? There is a reason for that. I think of our family as a unit. We are a family and we look to help each other. Still, what I do well affects others. What I fail at also affects them. So we are moving through this journey together. 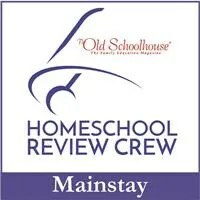 And when I evaluate and do better at my part in these things, I make our family stronger. The end is clearly marked by the calendar but what if we took a new approach and looked at it solely as the beginning? This is my beginning. I am beginning a new set of goals. I am beginning a new year. A new outlook. An ending is often a sad time but beginnings are seen as opportunity. So take this new beginning as an opportunity for whatever it is you desire. And write those goals, or desires, down. I tend to be very visual so I created these two little worksheets to help me think through the good, the bad, the ugly and to plan for where I can do better. I am going to post these in my notebook that I am beginning for Bible time/prayer time so that I see them often through the year and hopefully, it will help me. Remind me. Get me back on track when I wander. And help keep me accountable. I am also tying the 2017 goals into my “one word” for the year – CRAVE. I will share more on that word next week, as I am still trying to work through all the ways I want to apply this in the next year. Please print these and use them as you can see them benefitting you and your students or family. Please share, as well. All I ask is for you to link back to this page if you share them. Thank you! Linking this post up with the Homeschool Review Crew bloggers’ Reflecting on 2016 linkup.